Creston (population 542) is located in far north-central Illinois in the southeast corner of Ogle County. Illinois Route 38 is the main roadway to and from Creston and connects it to the metropolis of Rochelle just five miles to the west. The Chicago & Northwestern Railroad also travels through Creston. The history of the town of Creston has not yet been located. We were notified of the high school in Creston by our good friend Roberta Van Breisen. 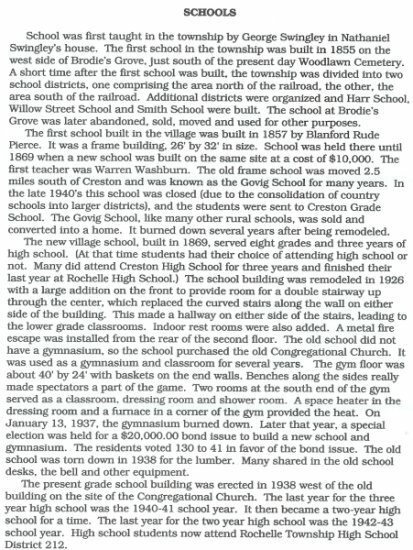 Roberta provided the folowing xerox copy of the history of Creston High School as found in the Creston Village History Book written in the early 1990s. Creston still supports its own grade school district that educates kids from "K" through 8th grades. 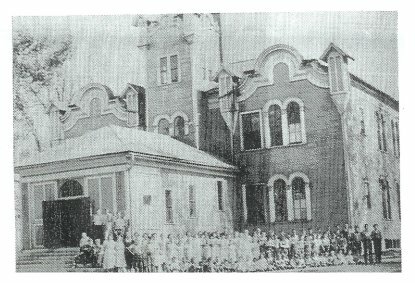 The current enrollment of this school is 74 students. We are hopeful the town continues to support this school for years to come. If you any information to share on Creston High School please contact us at eganann@sbcglobal.net. 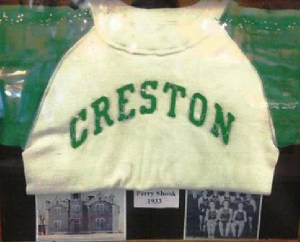 Creston HS team nickname: the "Colts"
We know that the Creston boys competed in basketball, football, and possibly, baseball and track as well. We are searching for the Creston High School team fight song. We would also like to list the season records, coach's names, and individual athletic accomplishments attained at the school. "Headons Meats in Creston was once a grocery that recycled itself into a quality meat and catering business. It is also a museum of sorts with great decor. Creston was once a very busy town on the original Lincoln Highway, 24 hours a day. The store even has the old water fountain that used to be on the corner. These school items have been lovingly saved and are on display behind the checkout." 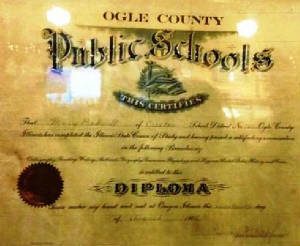 It is a good bet that the education offered at Creston High was well-rounded. 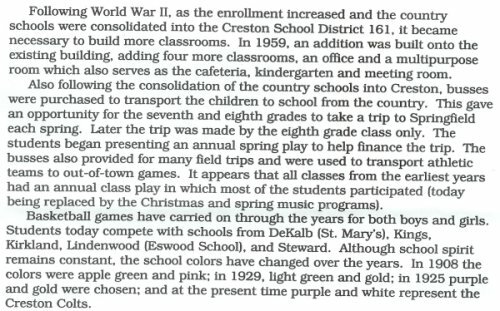 Plays, band, chorus, FFA, FHA, banquets, and dances were all likely an important part of the Creston High School experience. 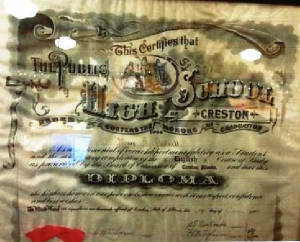 "I ATTENDED CRESTON HIGH IN 1934, 1935, AND 1936. ONE SPECIAL THING THAT HAPPENED WHILE I ATTENDED SCHOOL THERE WAS A HUGH WINTER SNOW STORM. THE WEATHER WAS VERY BITTER COLD AND THE AVAILABLE SNOWPLOWS COULD NOT HANDLE THE AMOUNT OF SNOW. SCHOOL WAS OUT OF SESSION FOR SOME TIME. BASEBALL WAS A FAVORITE SPORT FOR THE BOYS. THE GIRLS ENJOYED WATCHING THE GAMES. WE SAT ON THE FIRE ESCAPE THAT EXTENDED FROM THE SECOND FLOOR TO THE GROUND LEVEL. 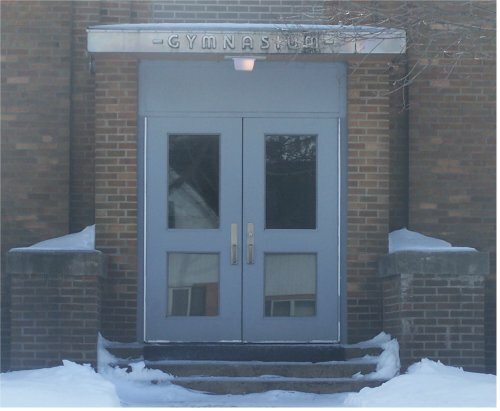 IN THE WINTER, BASKETBALL WAS PLAYED IN ANOTHER BUILDING THAT WAS A FORMER CHURCH. THE BOYS HAD AN EXCELLENT TEAM AND WON THEIR CONFERENCE. THE GIRLS ALSO HAD A BASKETBALL TEAM WHILE I ATTENDED SCHOOL THERE. WE PLAYED OTHER SMALL SCHOOLS IN THE AREA. IT WAS FUN. THE MAIN BUILDING WAS 2 STORIES. THE LOWER LEVEL HELD 2 CLASSROOMS. ELLA DAILEY TAUGHT ONE GROUP AND EVA FOGLEMAN TAUGHT THE OTHER GROUP. 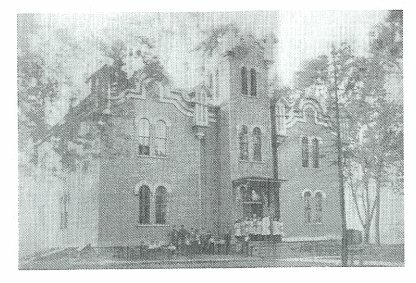 THE HIGH SCHOOL WAS ON THE UPPER LEVEL, AND THE 7TH AND 8TH WERE IN ANOTHER ROOM ON THE SAME LEVEL. WE WERE FORTUNATE TO HAVE VERY GOOD TEACHERS. R.W. BUNTING WAS THE PRINCIPAL. HE ALSO TAUGHT SEVERAL CLASSES INCLUDING HISTORY AND LATIN. LATIN WAS TAUGHT FOR TWO YEARS. THAT SEEMED LIKE A LOT OF LATIN. MR. BUNTING KNEW IF ANY STUDENT WENT TO COLLEGE IT WAS A REQUIRMENT TO HAVE A FOREIGN LANGUAGE. HOWARD BRETT WAS AN EXCEPTIONALLY GOOD TEACHER FOR MATH, SCIENCE AND BIOLOGY. HE ALSO COACHED THE BOYS BASKETBALL TEAM AND WAS PROUD OF THEIR SUCCESS. VERNIE KING TAUGHT SEVERAL CLASSES INCLUDING ENGLISH CLASSES AND HOME ECONOMICS WE LEARNED TO COOK AND DO SOME SEWING. WE EVEN COOKED A COMPLETE DINNER FOR THE VICTORY DINNER FOR THE BOY'S TEAM. THIS CONCLUDES MY MEMORIES OF A GREAT SCHOOL-CRESTON HIGH SCHOOL." Our "thanks" goes out to Roberta Van Breisen for finding this gem of a school! !